"Hey...wouldn't it be crazy if we jumped?" "Oh don't be such a ______." They had no idea I was doing this. What if I had gotten hurt, or worse, and they got a phone call or a knock on the door that day. Over what? Jumping off some stupid bridge for 30 seconds of thrills, and a swim that could have been my last. Again, pure stupidity. Yes, that is the actually bridge. 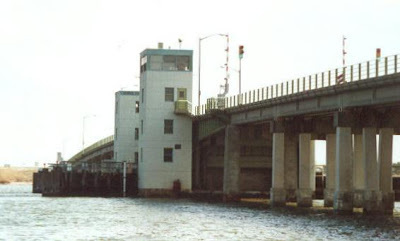 Smith's Point Bridge, Long Island, New York. For the record our Mother still gives her a slap to this day when we relive this adventure. No worries about my Amber ever doing this - she would need someone on either side of her to hold her hand.... If she even goes over a bridge - I mean this kid gets excited when she makes the full ride on the merry-go-round on the bench!! !